There are plenty of reasons not to like string theory. Philosophical and logical arguments against the theory have long been apparent. Strong scientific evidence is increasingly joining them. The discovery of the Higgs boson exactly where the Standard Model says it should be last summer at the LHC was a first blow. Now, more evidence is coming in. 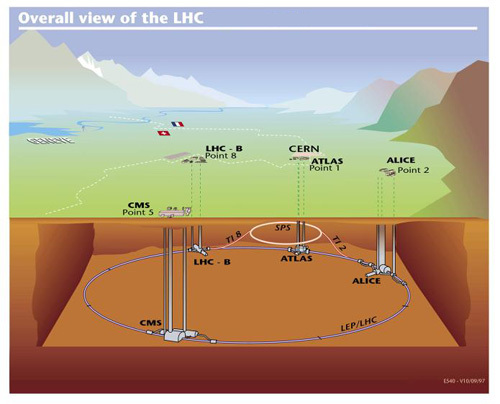 This week, LHCb (LHC-B), one of the many huge experiments along the LHC ring, reported a major result. The result itself is very technical, but its implications are general: big trouble for physics theories that involve supersymmetry (SUSY), string theory and many similar theories included. If SUSY is discarded, string theory goes right out with it. How is the new physics coming out of the LHC closing the window of validity for string theory? When the LHC smashes its particles together at world record energies, a shower of debris (new particles) is created. Large detectors surround the circumference of the ring itself, like insulation built around a pipe. When a collision happens inside the pipe, the resulting particles get caught by the detector wrapped around it. The detector pours out a massive amount of data, telling where every particle goes. The data itself is enough to fill a modern computer hard drive every second. To sift through all this information requires a tremendous amount of computer processing. What physicists ultimately want to know is the mass and trajectory of each particle that was created in the smash-up. They try to recreate the entire scene, from the collision through all the debris flying into the detector. In this case, physicists were looking for a particular particle called the "strange B meson" (Bs) to break into two more particles, called mu particles (μ+ and μ-). These strange B mesons usually only live for roughly just less than one trillionth of a second before breaking apart (called decaying). Here's where the Standard Model (SM) vs. Supersymmetry (SUSY) argument comes in. If the SM is correct, about once in every 280 million times the Bs decays, the two μ particles should be detected. The number found by the LHC? Roughly once every 310 million times, with some uncertainty. Very close agreement, especially for such a rare and hard to detect decay. SUSY supporters had put forth a number for this prediction. Then, as noted by Peter Woit, they changed it when experimental data ruled them out. Then they were shown wrong and changed it again. Now the third prediction has proven wrong. Soon, we will reach a point where further changes in prediction will leave SUSY, and by extension string theory, practically unobservable to us, thus moving them out of the realm of science. String theory is truly being backed into a corner. Being a popular and respected field, theoretical SUSY and string research will continue on. If more news like this keeps coming out, however, funding may begin to wane in the coming years. Perhaps this will spawn a fresh theory, both more testable and more accountable.